Sunday 24th February 2019, 5.00pm. Performance of Allusions for clarinet solo by Elias Rodriguez at the Fondation des États-Unis, (Grand Salon), 15 boulevard Jourdan 75014Paris. Free entry. Saturday 16 February 2019, 3.30pm. Performance of Sitting in the Ruins at the Conservatoire Municipal W.A. Mozart, 7 passage de la Canopée, Paris 1er. Gena Liévano and Louis Luciat (oboes), Shoan Eon (bassoon). Participation in the Forum des nouveaux répertoires pédagogiques, Saturday 1st December 2018 at the Conservatoire Municipal W.A. Mozart, 7 passage de la Canopée, Paris 1er. Premiere of Sitting in the Ruins - Trio for Two Oboes and Bassoon performed by students of Marika Lombardi. Saturday 4th August 2018, 5pm, Église de Saint-Genou. Piano Trio Variations on a Theme from At the Hawk's Well (2001) will be performed at Les Musicales de Saint-Genou by Adela Farcas (violin), Béatrice Raimbourg (cello) and Laurent Cabanel (piano). More information here. Festival brochure (PDF). Saturday 7th April 2018, 8pm église Saint-Merri, Paris 4ème. 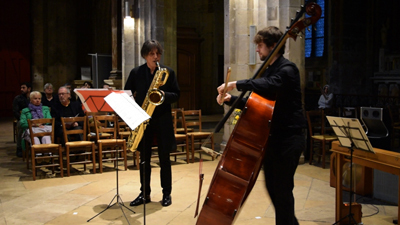 Premiere of Nocturne for baritone saxophone and double bass in Paris by the ensemble "Traces d'Aujourd'hui". Eric Tallet (sax) and William McClain Cravy (bass). Recording of Fanfare for Orchestra by the New Zealand Symphony Orchestra, conducted by Marc Taddei at the Michael Fowler Centre, Wellington NZ, Thursday 25th January 2018. Recorded by RNZ Concert as part of the 2018 NZ Composer Sessions in association with NZSO, RNZ Concert and SOUNZ. Sunday 21st January 2018, 4pm, Visconti Variations (Duo for Violin and Viola) will be performed by Guanxi Masse (violin) and Nigel Keay (viola) in a programme for string trio at église Notre Dame des Pauvres, 27 boulevard Galliéni, 92130 Issy-les-Moulineaux. Works by Schubert (Trio D.581), Keay and Roussel (Trio op.58). Poster of concert PDF. Sunday 10th December 2017, 5.00pm. Le Loup et l'Agneau for narrator and piano at Église Notre-Dame-d'Espérance de Paris, 47 Rue de la Roquette, 75011 Paris. Valérie Loriot (narrator) and Jennifer Lee (piano). Poster with details of concert (PDF). Participation in the Forum des nouveaux répertoires pédagogiques, Saturday 2nd December 2017 at the Conservatoire du centre Mozart, Paris (Oboe Sonata). Publicity PDF. Moderato à cent d’huîtres was performed by Sylvain Durantel and Emmanuel Christien on the 18th August 2017, 5pm, at Nakameguro GT Plaza Hall de Tokyo. Sunday 23rd July 2017, 5.30pm. Le Loup et l'Agneau for narrator and piano was premiered by François Castang and Jérémie Honnoré at Festival Musique à la Ferme, Lançon-Provence. Saturday 20 May 2017, 8.30pm (Night of Museums). Souffle coupé for wind quintet was performed by the Ensemble Quintitus at the Musée des Avelines, 60 rue Gounod, 92210 Saint-Cloud, Ile de France. More information on this event. 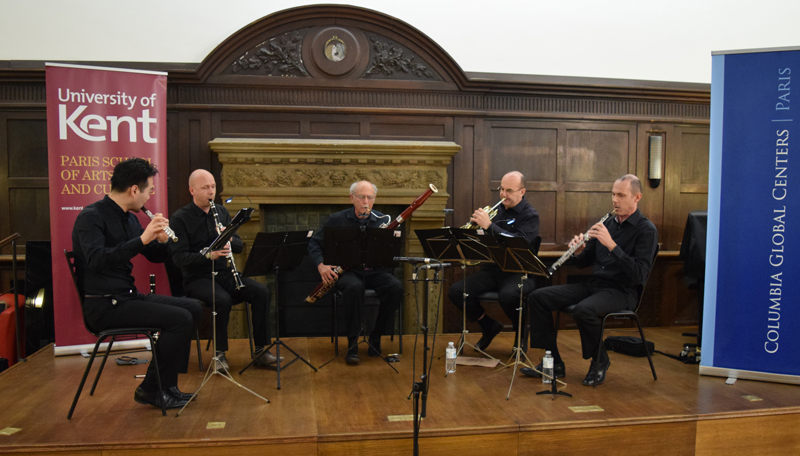 Saturday 11 March 2017, 7.30pm Soufflé coupé for wind quintet was premiered by the French-American Ensemble Quintitus at Reid Hall, 4 rue de Chevreuse 75006 Paris. PDF poster. The concert was hosted by University of Kent Paris School of Arts and Culture and Columbia Global Centers Paris. Thursday 15th December 2016. 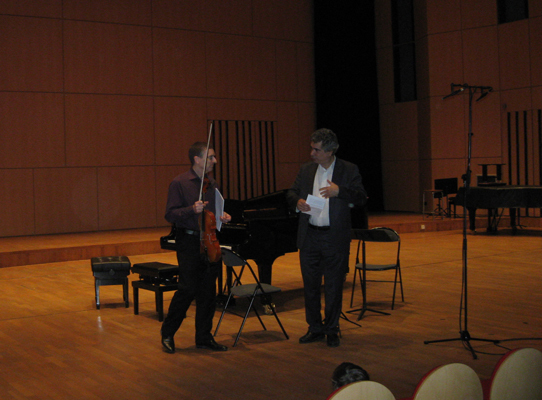 Jean-François Bescond performed Allusions for clarinet at The Xian Conservatory of Music, Shaanxi, China. Sunday 20th November 2016 at 3.30pm the contemporary music ensemble Traces d'Aujourd'hui at l'Église Saint-Ambroise, 71bis bd Voltaire, Paris 75011 (Allusions pour clarinette solo and works by Charpentier, Wolff, Noda, Rosaz, Denisov, Shinoara). Poster of concert PDF. VENERDÌ 18 novembre 2016, 20;00, Magazzino Musica, via Francesco Soave 3, 20135 Milan, Italy. Marika Lomabrdi oboe e Nathalie Dang piano presenteranno alcuni dei brani registrati per Continuo Records nel disco "Créations" . Musiche di Antonioni, Campogrande, Keay Sonata 1° movimento per oboe e piano (2012)), Dachez, Gurvitch... Ingresso libero. Vendita e dedica del CD dopo il concerto. Wednesday 20th July 2016, 9pm moderato à cent d'huîtres for viola and piano. Cédric Lebonnois & Emmanuel Christien at the Festival Musique à la Ferme, Grange de la Chèvrerie, Lançon-Provence, France. Flyer PDF. 9th June 2016, 5pm. Presentation of the new album "Créations" by Continuo Records in Rome (Oboe Sonata). Discoteca di Stato di Roma Via Michelangelo Caetani, 32, 00186 Roma. Thursday 12th May 2016,	8pm	Italian Cultural Institute, Paris	France. 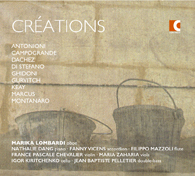 Presentation concert of Marika Lombardi's new double album « Créations » by Continuo Records (performance of the 1st movement of Oboe Sonata) (Invitation PDF). Terrestrial Mirror was played by Susan Carmichael (flute), Erin Reilly (viola), and Grace Bauson (harp) in Susan Carmichael's DMA lecture recital on Tuesday April 12, 2016, 7 p.m. at Shenandoah University, Winchester, Virginia, USA. 13, 16, 19 & 20th March 2016. Performances of Prelude for Cello & Piano by the Spooner Mosley Duo for Chamber Music New Zealand (Gisborne, Wanganui, Cromwell & Gore). Monday 7th December 2015, 8pm. 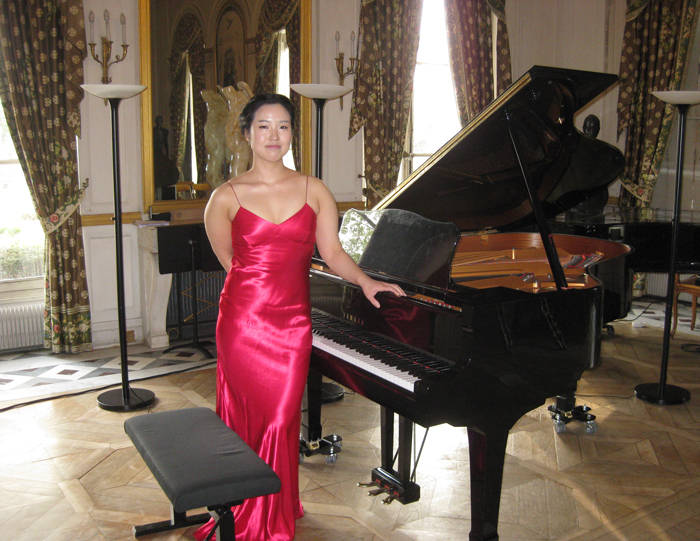 Jennifer Lee performed the dancer leads the procession at the Maison d'Italie, Cité Universitaire, Paris in a programme with works by Salvatore di Stefano, Jean-Claude Wolff, Martin Loridan and Maurice Ravel. La Cuisine à l'alto (moderato à cent de huîtres) at the Théâtre du Casino Barrière, Deauville, 23rd October, 8.30pm (Poster PDF) - and also at Salle Val de l'Isle à Troyes, 25th October 2015, 4.30pm. Sunday 18th October 2015, 6.30pm on Bateau Daphné, Quai Montebello, Paris. Oboe Sonata with Marika Lombardi and Nathalie Dang. Variations on a Theme from At the Hawk's Well (2001) was broadcast on Radio New Zealand Concert's programme "Made in New Zealand" 6pm, 13th June 2015. Anastasiya Filippochkina (vln), Gabriel Casalis (cello), Debra Takakjian (pno) (Blumlein CD-A 023). 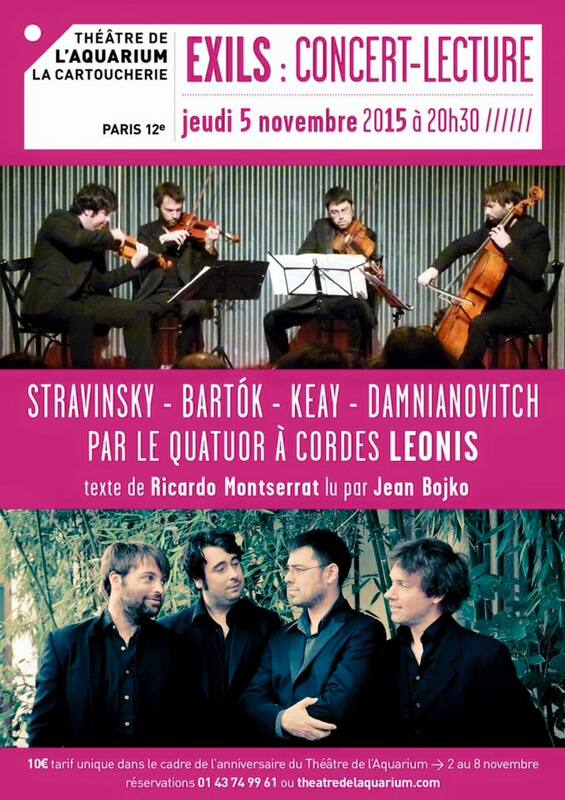 Friday 29th May, 2015, 8.30pm, Quatuor Leonis performed String Quartet No.2 at the Maison du peuple, Fourchambault as part of their "Exiles" programme which included works by Stravinsky, Bartok & Damnianovitch. Friday 24th April 2015, 7pm. 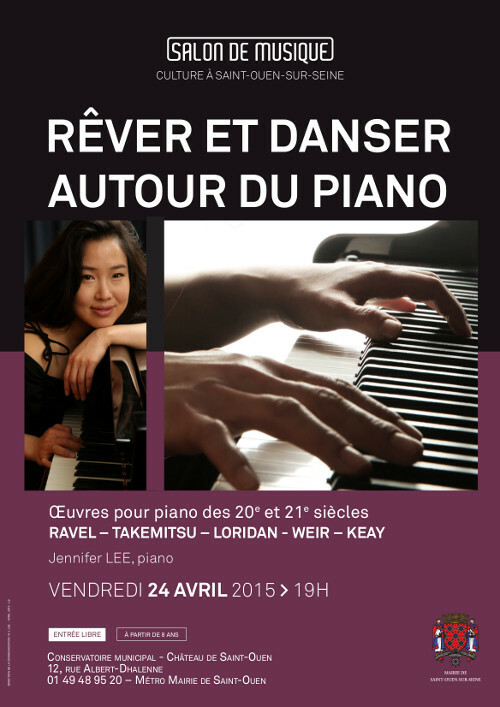 Jennifer Lee performed the dancer leads the procession in a recital of piano music at Conservatoire de musique, théâtre et danse, Château de Saint-Ouen, 12 rue Albert-Dhalenne, 93400 Saint-Ouen. Poster (jpg). Photo. 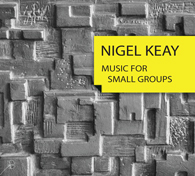 Friday 24th April 2015; release of new CD of music by Nigel Keay; the dancer leads the procession for piano, Diversions for Quintet, Allusions for Clarinet Solo, Double Jeu for Two Violas, Piano Quartet, Little Tango Suite. Tuesday 7th April 2015, 7.30pm. Quinteto Contraste performed Diversion 1 in a concert of chamber music at Casa da Música, Porto, Portugal. 28th March 2015, Jean-François Bescond performed Allusions at the 2015 Troy University Clarinet Day (Alabama, USA). 26th March 2015, 4.30pm. Visconti Variations was performed by Jessica Oddie (violin) for her Master's Recital with Lucy Caplan (viola) at Morse Recital Hall, Yale School of Music. Sunday 22nd March 2015, midday. Quatuor Leonis performed String Quartet No.2 at the Théâtre de l'Aquarium, La Cartoucherie, Vincennes, Paris. JPG poster of concert. Monday 2nd March 2015, Visconti Variations broadcast on Radio New Zealand Concert (Simone Roggen & Cyprien Busolini). Wednesday 8 October 2014, 20h30. Korutet, Alice Fagard (voice) and Frederik Sakham (contrebasse) will perform Tango Suite and String Quartet n° 2 at the Église protestante unie de Pentemont, 106 rue de Grenelle, Paris 7ème. 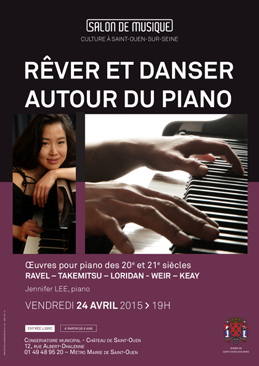 Affiche (PDF) of concert. Programme (PDF). Sunday 5th October 2014, 5pm. Tango Suite will be performed by Alice Fagard (voice), Korutet & Frederik Sakham (double bass) at Eglise Notre Dame d'Espérance, 47 rue de la Roquette, Paris 11ème. Programme (PDF). Wednesday 24th September 2014, 7.30pm. Korutet perfromed String Quartet No. 2 at One2One Café (121 Ponsonby Rd, Auckland NZ). Thursday 19th June 2014, 7.30pm, performance of Prelude for Cello and Piano was performed in Paris by Joseph Spooner and Kathryn Mosley as part of an international conference on Katherine Mansfield (19 - 21 June, Université Paris 3 in conjunction with the Katherine Mansfield Society). Thursday 22nd May 2014, "Piece for Judith Clark" (aka Interlude for Piano) broadcast by Radio New Zealand Concert during its "Appointment" programme "Judith Clark CNZM (1931-2014)"; http://www.radionz.co.nz/concert/programmes/appointment/audio/2596608/judith-clark-cnzm-1931-2014 (Begins at 31'25"). 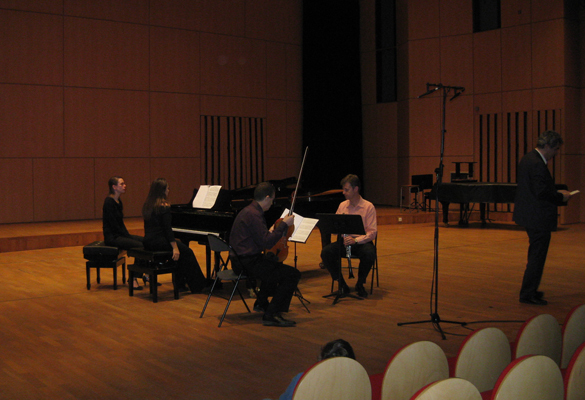 Allusions for Clarinet Solo was performed in Lublin, Poland on 7th May 2014 by Jean-françois Bescond. Sunday 15th December 2013 7pm. Diversions for Quintet was performed at Kerr Street Artspace, Devonport, Auckland in a concert by the Intrepid Music Project. Musicians; Charmian Keay - Violin, Rachel Grimwood - Viola, Gemma Price - Oboe, Finn Schofield - Clarinet, Eric Scholes - Double Bass. 5th November 2013, 7pm. Piano Quartet (1986) was broadcast on Sound Lounge, Radio New Zealand Concert. This studio recording was part of the Resound project started in 2010 which was an initiative of SOUNZ, RNZ Concert and NZ On Air. It was played by the New Zealand Trio with Robert Ashworth (viola) and introduced by Kenneth Young. Friday 11th October 2013, 00h00-01h00; Broadcast of works on Radio France Musique "Tapage nocturne". Performers of the live session: Dora Cantella, Jean-Marc Fessard, Nigel Keay, Marika Lombardi, & John-Paul Muir. Programme details at the following link: http://www.francemusique.fr/emission/tapage-nocturne/2013-2014/session-live-de-nigel-keay-10-11-2013-00-00. Photos of Live Session. September 25th 2013. Jean-François Bescond performed Allusions for Clarinet Solo at the Urals Mussorgsky State Conservatoire in Yekaterinburg, Russia – Class of Igor Parischyuk. Saturday 31st August 2013, 5pm. Pierre Henri Xuereb and Julien Dabonneville performed Double Jeu for Two Violas at la Fête de l'Alto, Lasalle, La Filature, Cévennes, France. Friday 30th August, 2013. String Quartet No.2 was broadcast on France Musique (Radio France) in the programme "Plage" presented by Bruno Letort. Saturday July 27th, 2013. Allusions for Clarinet Solo will be performed by Jean-François Bescond at the 2013 ClarinetFest in Assisi, Italy (Accademia Italiana del Clarinetto). Saturday 22nd June, 2013. Little Tango Suite was performed by Gemma Lee (piano) at the Salvation Army Church, Howick, Auckland. Tuesday 4th june 2013. Trio for Clarinet, Viola and Piano was broadcast on Radio NZ Concert "Sound Lounge" (rescheduled from 28th May 2013). Performed by Jean-François Bescond, clarinet, Nigel Keay, viola, Dora Cantella, piano. Recording from the Cantus Formus concert of 27th October 2012. Monday 13th May 2013, 7.30pm. Diversions for Quintet was performed by Elm Ensemble, Spiegelfoyer Chamber Music Concert, Graz Opera, Austria. (Yukiko Imazato-Härtel - violin, Oliver Biber - viola, Kamen Nikolov - oboe, Christoph Gaugl - clarinet, Rudolf Thausing - contrabass). Programme (PDF). Sunday 12th May 2013, 5pm, Ensemble Polymnia performed Serenade for Strings under the direction of Sarah Bisley at Holy Trinity Church, Devonport, Auckland NZ. Programme (PDF). Saturday 23rd February 2013, 8pm. Duo à la française, Marika Lombardi (oboe) and Nathalie Dang (piano). Auditorium de la Cité des Arts, 18 rue de l’Hôtel de Ville Paris, 4ème Métro Pont Marie. The duo will give the first performance of a new Sonata for Oboe and Piano by Nigel Keay. Also on the programme is music by Jolivet, Vaughan Williams, Leon Gurvitch & Kathryn Potter. Video of concert performance. 27 October 2012, 5pm. Trio for clarinet, Viola and Piano. Jean-François Bescond - clarinet, Nigel Keay - viola, Dora Cantella - piano. Grand Auditorium of the Paris CRR (Conservatoire à rayonnement régional de Paris), 14 rue de Madrid, 75008 Paris. Concerts CANTUS FORMUS direction: Nicolas Bacri. Programme (PDF) Photo of trio. Photo 2. Piano Quartet (1986) recorded on 31st May 2012 by NZ Trio (with Robert Ashworth, viola) at Roundhead Studios in Auckland for Radio NZ Concert with funding from NZ On Air. Diversion 1 for Quintet was performed on 30th March 2011 in a concert by Quinteto Contraste at the Auditório do Conservatório Nacional do Porto, Portugal. The concert was broadcast live on the station Antena 2, Rádio e Televisão de Portugal (RTP). Quinteto Contraste: Luís Alves, oboe | David Silva, clarinet | Mariana Costa, violin | Sara Barros, viola | Samuel Abreu, double bass. Terrestrial Mirror for Flute Viola and Harp recorded for the CD Music for Small Groups on 7th March 2011 by Paolo Vignaroli - flute, Nigel Keay - viola, Delphine Latil - harp. Diversions for Quintet was performed on 21st March 2010 at the Providence United Methodist Church by musicians from the Charlotte Symphony Orchestra (North Carolina). The players were: Hollis Ulaky - oboe, Dru DeVan - clarinet, Tatiana Karpova - violin, Ellen Ferdon - viola & Jeff Ferdon - double bass. Diversions for Quintet was performed in a concert on 7th March 2010 by Marika Lombardi - oboe, Erika Bliznik - clarinet, Charmian Keay - violin, Joe Ichinose - viola, and Raphaël Schwab - double bass as part of the Paris Oboe Festival in 2010, 4.30pm. Le Bateau Daphné Quai Montebello, 75005 Paris, M° : Saint-Michel. 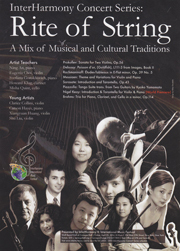 Festival Oboe 2010 brochure. Nigel Keay's arrangement of the 4th Movement of Brahms's Fourth Symphony was performed in a concert entitled "Fugues et Compagnie" by the Ensemble des Antipodes, 8pm, Saturday 19th September, 2009 at Eglise Luthérienne de la Trinité, 174 boulevard Vincent Auriol, 75013 Paris. Duo for Violin and Viola "Visconti Variations" was performed by Orchestre 2021 on Thursday 30th April 2009, 8.30pm at the Fondation des Etats-Unis (Grand Salon), 15 boulevard Jourdan 75014 Paris. Diversions for Quintet was performed by the soloists of Orchestre 2021 on Friday 30th January 2009 at the NZ Embassy, Paris for the France-NZ Association. Musicians: Marika Lombardi - oboe, Erika Bliznik - clarinet, Aude de Larouzière - violin, Nigel Keay - viola, Guillaume Pagnon - contrabass. Diversions for Quintet was performed by the soloists of Orchestre 2021 along with Variations on a Theme from At the Hawk's Well for Piano Trio - 30th October 2008, 8.30pm, Fondation des Etats-Unis (Grand Salon), 15 boulevard Jourdan 75014 Paris. Musicians: Herbert Lashner - oboe, Erika Bliznik - clarinet, Aude de Larouzière - violin, Nigel Keay - viola, Bénédicte de Larouzière - cello, Guillaume Pagnon - contrabass, Anne Bertin-Hugault - piano. Tango Suite for String Quartet was performed in an Orchestre 2021 concert on Thursday 17th April 2008, 8.30pm at the Fondation des Etats-Unis (Grand Salon), 15 boulevard Jourdan 75014 Paris. Orchestre 2021 conducted by Elizabeth Askren performed Serenade for Strings on Thursday 6th December 2007, 8.30pm at the Fondation des Etats-Unis (Grand Salon), 15 boulevard Jourdan 75014 Paris. Diffractions for Piano & Orchestra was performed on 14th June 2007 at the Fondation des Etats-Unis (Grand Salon), 15 boulevard Jourdan 75014 Paris, by the Orchestre 2021 conducted by Nigel Keay with Jeffrey Grice as soloist. String Quartet No.2 was performed at a private concert in rue seguier, Paris on Thursday 3rd May 2007, 8.30pm (Daniel Rémy - violin 1, Iwona Janaillac - violin 2, Nigel Keay - viola and Dimitri Kindynis - cello). Variations on a Theme from At the Hawk's Well (2001) was performed on 22nd March 2007 at the Music Department of the University of Otago (NZ) by Charmian Keay (violin), Jono Squire (cello) and Tom McGrath (piano). The pianist Jeffrey Grice performed Nigel Keay's the dancer leads the procession at Salle Gaveau in Paris on Wednesday 14th February 2007 at 8.30pm. Poster for this concert. - Sunday 9th April 2006, 6.30pm at Eglise Évangélique allemande, 25 rue Blanche, 9ème arrondissement, Paris. - Saturday 10th December, 2005 at 8.30pm at Eglise Notre Dame des Champs, 92 bd du Montparnasse, Paris 6ème arrondissement. Diversion 3 was given a reading by the New Zealand Symphony Orchestra at the NZSO-SOUNZ Readings on November 16th, 2005 in Wellington. For information on this event contact SOUNZ (Centre for New Zealand Music) (info@sounz.org.nz). Orchestre à cordes Idoménée conducted by Didier Jacquin performed Serenade for Strings by Nigel Keay at 9pm, Saturday 24 September 2005 at Saint-Christophe-de-Javel, 28 rue de la Convention, 15ème arrondissement, Paris. String Quartet No.2 (1995) was performed on Saturday 19th March 2005, 9pm at Eglise Saint-Germain de Charonne, Paris by the quatuor Aphanès. Adagio for Strings was played on 16th January 2005 in the American Cathedral in Paris in a special concert organised by the Paris Choral Society and Orchestra to raise funds that will provide emergency assistance and more long-term aid to the victims of the December 2004 earthquake and tsunamis in South Asia. String Quartet No.2 (1995) was performed on 11th January 2005 by Quatuor Aphanes at the OECD in Paris with proceeds going to help the War on Hunger Group of the OECD. Quatuor Aphanès performed String Quartet No.2 at Kleines Theater Oberammergau at 8pm, Saturday 2nd October 2004. 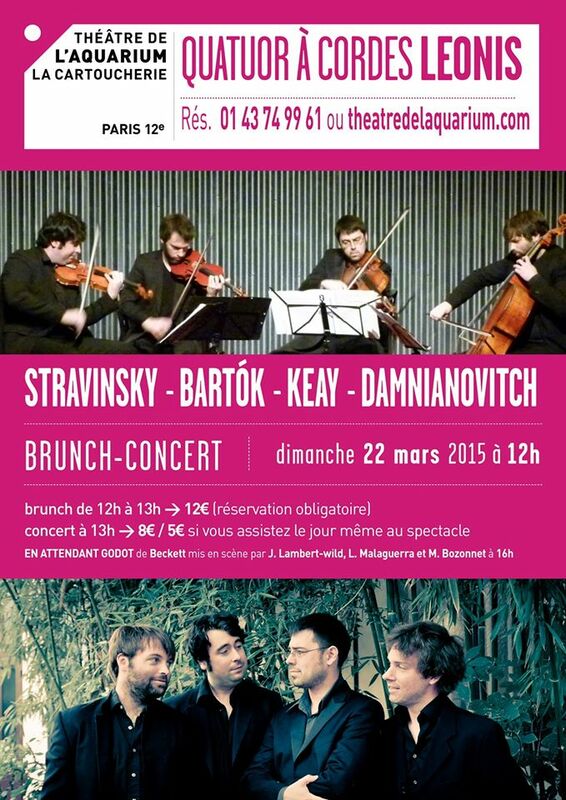 String Quartet No.2 (1995) was performed on Saturday 7th February 2004 at Eglise Saint Jean-Bosco de Paris. PDF Programme. String Quartet No.2 (1995) was performed on Saturday 13 December 2003, 9pm at Eglise Saint-Denys d'Arcueil, Ile de France by Quatuor Aphanès. the dancer leads the procession recorded by Jeffrey Grice for Radio New Zealand in April 2003 for national broadcast shortly after being included in his programme on an Associate Music Societies Chamber Music New Zealand tour. Jeffrey Grice performed the dancer leads the procession at The Woolshed in a Te Awamutu Music Federation concert on the 11th April 2003. Jeffrey Grice performed the dancer leads the procession in the Waikanae Memorial Hall on Sunday 6 April 2003 in a concert produced by The Waikanae Music Society. the dancer leads the procession performed by Jeffrey Grice at La Halle Saint-Pierre, Paris 18ème. 20th March 2003. Radio France, France Musiques, Friday 31st January 2003, 22,30pm. Broadcast of Tango Suite (commissioned by Radio France. Musicians: Madeleine Jalbert, Quatuor Diotima, Jean-Olivier Bacquet. String Quartet No.2 was performed by the Nevine String Quartet at Richmond Church on the Hill, Nelson, NZ on Friday 31st January 2003, (12.10pm-13.10pm) as part of the Adam New Zealand Festival of Chamber Music. String Quartet No.2 was performed on 23, 24 & 25 November 2002 by Ensemble Philharmonia in Auckland. Miranda Adams & Mark Bennett (violins), Christine Bowie (viola), Claudia Price (cello). Saturday, Nov. 23, 12noon, Auckland City Art Gallery Theatre, Sunday, Nov. 24, 12noon, Titirangi Community House, Monday, Nov. 25, 12noon, Franklin Arts & Cultural Centre, Pukekohe. the dancer leads the procession was performed by Jeffrey Grice on 3rd October 2002 at La Halle Saint-Pierre, Paris 18ème. String Quartet No.2 was performed on 22nd September 2002 by the Nevine String Quartet in the Ilott Theatre, Wellington. Recorded vby RNZ. Recording of Serenade for Strings by the New Zealand Symphony Orchestra under the direction of Hamish McKeich for one of the Rehearsed Readings sessions organised by SOUNZ and the NZSO. This took place on the 21st & 22nd March 2002 at the Brierly Centre, Wellington College. Nigel Keay's Viola Concerto was performed by the Chamber Orchestra of the New Zealand Symphony Orchestra with Franck Chevalier as soloist, conducted by Marc Taddei at the 29th International Viola Congress in Wellington on 12th April 2001 in the Riley Centre, Wellington. The Quatuor de Capriccio (Geoffroy Voisin and Estelle Fouillet - violins, Nigel Keay - viola, and Amélie Mabire - cello) performed String Quartet No.2 at La Maison de Quartier de Venoix, Caen, on at 5pm Sunday 7th May 2000. The Nevine String Quartet performed String Quartet No.2 at Saint Andrew's on the Terrace, Wellington on 25th June 1997. Symphony in Five Movements was performed by the Auckland Philharmonia Orchestra on the 1st August 1996 in a concert at the Aotea Centre, Auckland, NZ as part of an APO Main Series programme. The Ensemble Contemporary Alpha (The Tokyo National University of fine Arts and Music) performed String Quartet No.2 on Tuesday, December 5th, 1995 (8pm) in the Chulalongkorn University Auditorium as part of the 17th Conference and Festival of the Asian Composers League held in Bangkok (2-9 December 1995. Fanfare for Orchestra was performed by the Auckland Philharmonia Orchestra on the 22nd June 1995 conducted by Edvard Tchivzel at a Main Series Concert at the Aotea Centre, Auckland, NZ. Triptych (1988) was given its premiere performance on Monday 15th April 1991, 5.15pm in the Adam Concert Room, School of Music, Victoria University of Wellington. String Quartet No.1 was performed by the Nelson String Quartet on Thursday 27th September 1988 at the Nelson School of Music, NZ. Dawn Oaten - violin 1, Margaret Jackson - violin 2, Miranda Adams - viola, & Helen Boulton - cello. Diffractions was performed at the NZSO's Sonic Circus Saturday 31 October 1987 at the Michael Fowler Centre, Wellington, NZ with David Guerin as soloist conducted by Francisco Feliciano. Programme of concert PDF. Diffractions was performed by the Dunedin Sinfonia on September 13th 1987 with Terence Dennis as soloist. The Piano Quartet in 3 Movements was given its premiere performance on Tuesday 25th March 1986, 1.10pm at Marama Hall, University of Otago. The players were Miranda Adams (violin), Nigel Keay (viola), Robert Davis (cello) & Angela Campbell (piano). String Quartet No.1 Premiere performance on the 27th November 1983 at the Dowse Art Museum, Lower Hutt, as part its 1983 Concert Series of NZ music. Performed by the Amabile String Quartet (Alan Foster, Glenda Craven, Lyndsay Mountfort, Annemarie Meijers). Variations for Violin and Piano was performed on the 27th November 1983 at the Dowse Art Museum, Lower Hutt by Miranda Adams (violin) and Gerard Parsons (piano).